No matter where you live, laundry seems to pile up quickly. But at the lake, without a well-designed laundry system, it can become an untamed beast. Friends, family and visitors mean extra linens, beach towels, bathing suits and clothing, and who wants to waste time washing when the lake beckons? Having an efficient and pleasant laundry space can help make this task both quicker and more enjoyable. If you are building or renovating a home, you have the chance to design a laundry room for optimal organization and function. 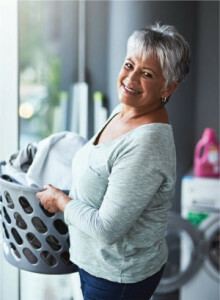 Even if you don’t have the budget for your dream laundry room, there are smaller design and efficiency changes that can go a long way toward improving your laundry experience. We’ve got some ideas and tips to help you streamline this space and get back outside. In traditional homes, opinions differ on the ideal spot for a laundry room. Some people prefer it near the bedrooms for easy access to closets; others like it close to the kitchen, where washing can be easily monitored while performing other tasks; and some folks prefer the convenience of having a laundry in the bathroom, where linens often congregate. 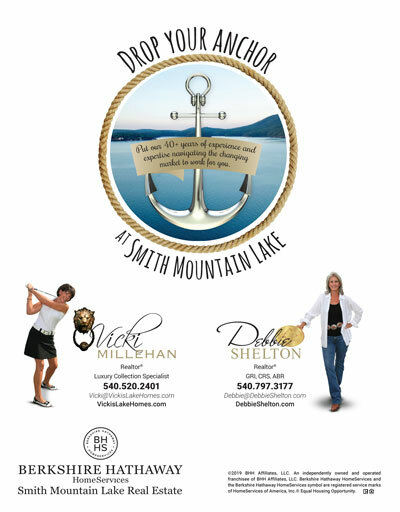 While the lake is no exception in that personal preference rules, the ideal laundry location might be a little different. Often, the best spot is near a ground-level walkout to the dock. This way you can direct soggy friends, family, and pets to this entrance, where dripping towels and suits can be wrangled before making their way into the house. A stacked, front-loading washer and dryer will save space. The extra square footage could be used for shelving that can hold standard-sized laundry baskets, to keep clean and dirty clothes organized and out of the way. Mini chalkboards or other signs for “clean” and “dirty” will ensure that no one drops a dirty towel into a freshly cleaned basket of clothes or towels. You might want to set out two laundry baskets—one marked “wet” and one marked “dirty”—so you can prioritize loads to get to the wet clothes before they get musty. A third basket could hold rolled, clean towels that could be grabbed if needed to dry off or on the way down to the water. If you can carve out space for a second laundry room or laundry closet, consider one closest to the bedrooms, for the easiest cleaning of clothes, sheets and towels. If you have a larger home or multiple levels, this might be upstairs, and used mostly for regular household linens. Alternatively, a laundry chute makes getting laundry down to the wash a snap. 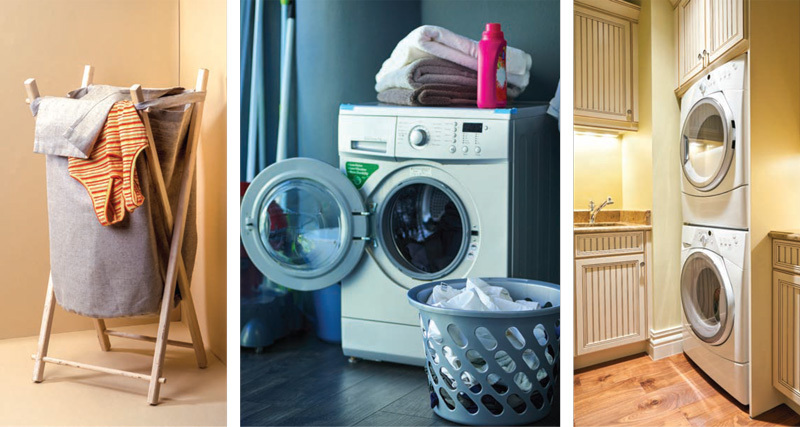 For a single laundry room which has extra space, consider installing two washers and two dryers. Like your own personal laundromat, it will save considerable time. Be sure to check Consumer Reports or test washer and dryer models in person to get a sense of the model’s noise level—even some newer machines are considerably loud, and dual washers and dryers will amplify the noise. To minimize space taken up by a drying rack, consider a model that hangs from the wall and retracts, or install a simple bar like one you’d find in a closet, where garments can be hung from hangers to dry. When designing an efficient laundry system, the laundry room itself isn’t the whole picture. To simplify life at the lake, think about using all white (or single hue) sheets and towels for all the bedrooms and bathrooms for maximum flexibility. Purchasing multiples of the same beach towel works too—they won’t be mistaken for anyone else’s. For guest quarters, you might designate a piece of furniture in the hallway or in the actual bedroom stocked with sheets, towels and toiletries so guests don’t have to go hunting them down—an armoire works great for this purpose. If you would like guests to use different towels for indoors and outdoors, again, small signs hanging near the armoire are a polite and clear way to communicate your preferences. A way to reduce your time doing laundry is, of course, to reduce the number of loads. Often, beach towels get dropped into a wet pile after everyone has climbed off the boat or out of the water. Letting them sit guarantees that they’ll need to be washed before they are usable again. But a beach towel doesn’t need to be washed after a single use if it is dried properly and is going to be used by the same person. Try hanging rows of hooks near the dock and every doorway that a bathing suit-clad family member or guest will be entering or exiting. It will be a space to hang a towel to dry, and it will be in the same spot when they want to grab it again to go back out. Mini chalkboards or other labels can also be used here to help everyone remember whose is whose. Retractable clothes lines that can be pulled out in a pinch and disappear when not in use prevent towels from being draped over wooden dock and decking areas, which can damage wood over time. When most people think of permanent clothes lines, they conjure images of the 1950s metal contraptions, or a simple rope tied from tree to house. While these still work, beautifully constructed clothes lines have come into vogue, made of high quality wood and cable with decorative flourishes. Consider installing one on your property and your guests can’t miss the hint. Cutting down on laundry loads is not only a time saver, but is good for the environment, too. With a bit of planning and thought, you can design a laundry system to make the most of your available space. Creating a method for managing the influx of lake-related laundry can help reduce the odds of finding wet piles inside, or having your deck rails covered in towels and suits. It can also help cut down the amount of loads you need to do, which is the best news of all when spending time at the lake. Consider dual washers and dryers. Running two loads at a time means maximum efficiency. Mark your laundry baskets. Signs on laundry baskets like “wet,” “dirty,” and “towels for outside” communicate your wishes clearly and cut down on wet or dirty clothes in the wrong places. Have plenty of places to hang wet towels and bathing suits. You can never have too many hooks or clothes lines! A towel or bathing suit dried in the sun can skip the washing machine a time or two.